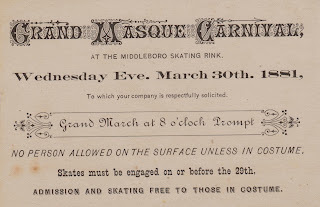 Recollecting Nemasket: Middleboro Skating Rink and the M. C. B.
Roller skating was one of the most popular pastimes of the 1880s, and locally the sport was sponsored by the Middleboro Cornet Band (M. C. B.) which managed the Middleboro Skating Rink, also known as the Nemasket Skating Rink, on Union Street. 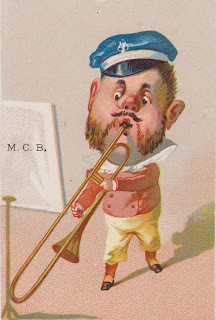 Established in 1865, the M. C. B. found that social occasions such as roller skating provided a perfect venue for their performances, and the band accordingly sponsored skating first at Middleborough Town Hall and later at the Middleboro rink where skaters could glide about the wooden floor, accompanied by popular tunes of the day. 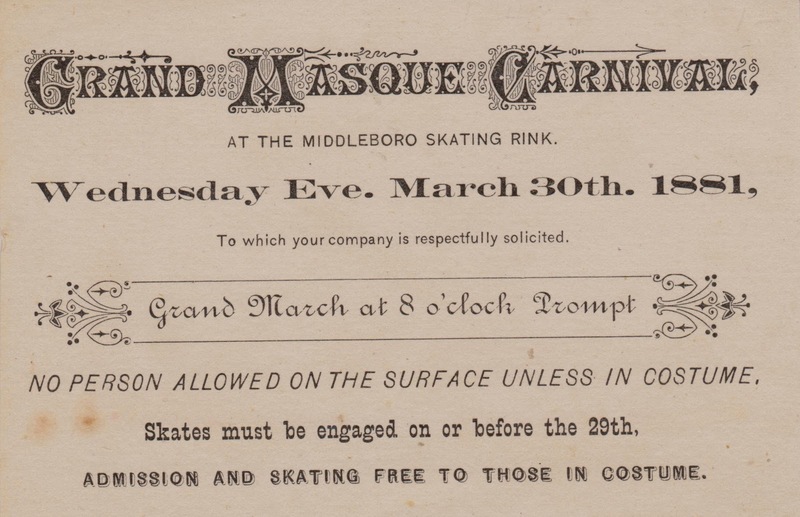 Frequently the band hosted more formal social functions at the rink, including 1881's Grand Masque Carnivale with skaters dressed in elaborate costumes participating. The rink operated through 1886 when it was disassembled, though the band continued to perform until the early 1900s. The colorful trombonist on the front reads music which is marked M. C. B., Middleboro Cornet Band, while the reverse provides the details for patrons. Skaters were not allowed on the rink floor unless dressed in costume.